Hi guys, it's time for another tutorial! This time I will show you how to make the lightning bolt French. The design is very simple to achieve and perfect for covering up extreme tipwear or VNL (visible nail line). What you need is just a bit of regular office tape and a pretty, opaque layering polish to match your base color. Let's get started! First apply your base color and let it dry completely. Or you can do this tutorial on an older mani, like I'm doing. On the picture I'm wearing Ms Jagger Green from Pieces that I applied the day before. As you can see there's a tiny bit of tipwear, but we're going to cover that up in a bit! Now cut a little piece of tape off the roll, and then cut the piece in smaller strips lengthwise. You only need one strip per nail, so you can save the rest of the strips for your other fingers. Also cut a bunch of triangle shaped pieces. First cut a piece off the roll, then cut it in half diagonally. Again, you only need one triangle per nail. 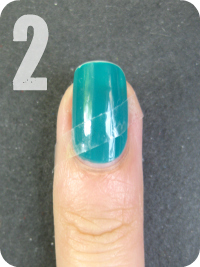 Then place one strip diagonally on your nail and make sure it's adhered perfectly on the surface. This is the part where you need the triangle. Place it on top of the strip that you've place in step 2. 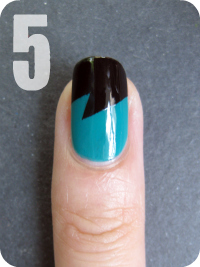 Make sure one point of the triangle is pointing to the tip of your nail, like shown in the picture. Now apply your top color. Of course you can pick any color you like, but personally I prefer contrasting colors so the pattern will really pop. And if you plan to cover up tipwear, make sure the layering polish is opaque enough. When you're done polishing, immediately but carefully pull off the pieces of tape. My advise is to do the painting and removing of the strips on one nail at a time. Polishes I used in this post are Pieces Ms Jagger Green and Color Club Where's The Soiree?. THANK YOU - i tried to do this and failed.....I needed this tutorial ~ this is so cool! I've been trying to do tape mani's-I think I'm starting to get the hang of it but I have one question...do you have to let the base color dry completely, or can you do it when it's a little wet? Thanks! Awesome! I was wondering how you did this, I'm so going to try this soon! I've already decided what colors I'm going to try this is- gunmetal and silver sparkle! Going to do it tonight! ziet er echt zo tof uit!!! I find that the nail polish on the side tends to pull up. how can i stop this? Your tutorial made it incredibly easy, so thank you!!!! I look forward to more fun designs! I'm trying it right now :). I'll post pictures in my blog if it works. Thanks a lot for all your wonderful tutorials :). I'm a new reader and already a fan. Thanks for creating an awesome tutorial! It was so easy to follow! I can't wait to do this design again. You are such an inspiration! Thank you for the wonderful tutorials! I am trying this TODAY! Ooh, thanks for posting that! You make it look so easy. I tried to do this mani a week ago but it was an epic fail. I'm not too patient, but I put my tape,I painted my nails and when I was going to pull off the tape,the nail polish peeled off too. I don't know what I did wrong.Any advice? @Davinia: Hi Davinia, if your talking about the polish underneath the tape that comes off, it probably wasn't dry enough. So give it a bit more time or apply the polish a day before to make sure it's completely dry. If it's the layering polish that comes off with the tape, try to apply thinner layers and always remove the tape as soon as possible (meaning when the polish on top is still wet). The top coat I use is either Seche Vite or Sally Hansen Insta-Dry. SV dries quicker and glossier but can cause shrinkage, to prevent this you can wrap your tips with the topcoat as well. SH is great too, it dries slightly slower than SV, but I like the thin formula, plus it doesn't cause shrinkage and doesn't get thick as fast as SV. I love this one, but I had the same problem as Davinia with the layering polish. I'm indian, and have darker skin.. any three-color ideas? @Anonymous: Thank you! And oooh, I think all bold colors look great on darker skin ^^ Something that usually works for me is to pick one color you like, then pick a color in the same hue but lighter or darker (ton-sur-ton) and for your final polish pick a completely different color that still shares the same color scheme. I LOVE THIS!! thanks for the tutorial. i got great results (above) and have tried a lot of your styles. they are super cute and overall just awesome. THANK YOU!! Hi Jane! Thanks for the tutorial - I had a bit of trouble with the placement of the triangle but re-did it and got it right. Here is the finished result! I want to try the double lightning bolt next! Ultimate goal is to do the Explosion nails! I love your blog, but I start by few days with my nails :D I'm not a great nail artist like you!!! I'm about to try this I absolutely love it!!! One question: do you put a top coat on your base color before you do the tip??? Thanks!!!! It's not necessary unless you find it to take to long to dry, in that case you can use a fastdrying topcoat (I use Seche Vite) to speed things up. 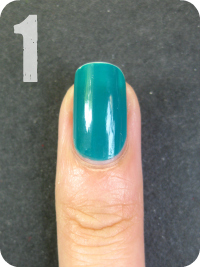 But a normal topcoat before the tip is definitely not required, in fact it will only make the drying slower! I tried your tutorial for my first tape manicure - it is so cute! Love it!! The glitters work so well with the design. :-D Thanks for your comment!